Like that first backyard barbecue or the 4th of July, the opportunity to roll up our shirt sleeves is something we look forward to with the onset of each summer. Now that warmer weather has finally arrived, we'll share two of our favorite takes for rolling sleeves smoothly and efficiently. The half-roll works best for when you can't totally commit to rolling up your sleeves for the day. It's ideal for sunny afternoons that may turn chilly, or for downtime between meetings. 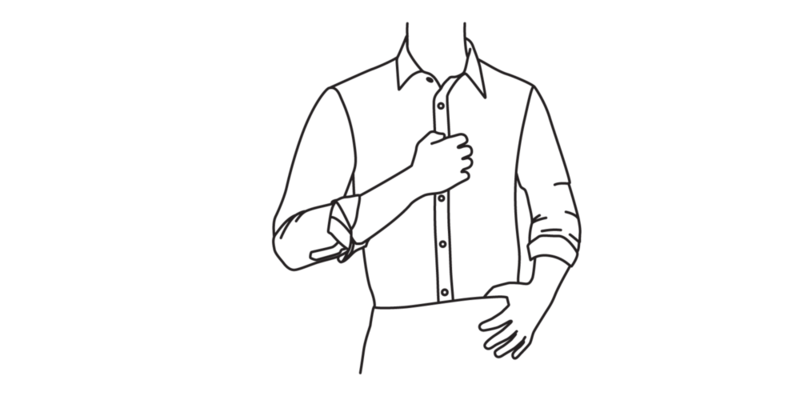 For this method, start by unbuttoning the cuff button, but leave the sleeve placket buttoned. Fold the cuff over once, then fold it once more over itself. This simple double fold will come to the center of the forearm, enough to vent some air and give you those casual vibes without causing too much wrinkling or creating a complicated fold you'll have to take down later. Employ this fold when you're firmly in off-duty territory, or plan to wear the sleeves-rolled-up until the end of the day. The key distinction is that you'll unbutton both the cuff and the sleeve placket, loosening the sleeve and allowing for freer movement. The first two steps are identical to the half-roll: start by folding the cuff over once, and then again over itself. Finish by folding the sleeve over itself once more, until it just hits the elbow. While you could keep going, three folds is a good medium between the sleeve appearing too loose or too tight, too low or too high. You can adjust the sleeve to make the fold uneven, but don't worry too much—a slightly uneven fold is all part of the casual charm.